To accomplish everything that Savannah West has, you must possess an unwavering commitment that influences every decision and action. At Amherst, the community associates her name with confidence and conviction. The political science and art history double major devotes herself whole-heartedly to all that she does, and after a brief interview with her, it’s quite obvious what nourishes that notable determination: her legacy. West has a hyperawareness of that which came before her, and therefore an ample readiness to work towards a better future for all those around her. At Amherst, we see the result of her conviction: her dance career, her role on the Judiciary Council, and her recent acceptance of a Fulbright fellowship. But behind the endless accomplishments lies a deeply rooted belief that one individual can be a catalyst for widespread progress. West was born and raised in Chicago, a city grounded in a vivid history, and one West describes as an ideal place to live. “It’s beautiful, accessible and cheaper than New York,” she said. West attended high school at St. Ignatius College Preparatory School where she was a member of the National Honor Society, the Latin National Honor Society, the Latin club and the dance team. She was just as determined to leave a constructive legacy then as she is now and was an active member of the Middle Passage, the school’s Black Student Union, and the president of Students Against Drunk Driving. West’s parents were also born and raised in Chicago, and West is heavily influenced by their determination and drive. “Both of my parents are African American. They were born and raised in Chicago, and they were dirt poor. Also, my parents’ lineage can be traced back to Arkansas slavery,” she said. West has been raised to remain aware of the struggles particular to minorities in America, and especially the African American experience. She said her family prides itself on a desire to give back to others, in hopes of one day expelling such racially rooted hardships from the future. The choice to attend Amherst was simply another chance for West to acknowledge the importance of her family’s legacy. West’s uncle, Arthur Reliford, was the first in her family to attend college, beginning his Amherst career in 1971. He was a member of the varsity basketball team, president of Drew House, President of the Black Student Union and was the first black studies major. However, he found that Amherst was “a hard place to be black,” West explained. Reliford found himself dissatisfied with the administration. In light of his struggles with the administration, he refused to walk at his commencement in 1976. Despite Reliford’s experience, West decided to continue the family’s Amherst tradition, in hopes that Amherst had changed for the better. West’s time at Amherst inspired Reliford’s decision to return to Amherst for the first time since he earned his degree — and this time he’ll certainly be attending commencement. West’s commencement will undoubtedly serve as a symbol for the change from Reliford’s Amherst career; West plans to get him a graduation cap, allowing him to officially graduate alongside her. For West, the decision to double major in political science and art history came naturally as she explored her academic interests. Through the guidance of professors and a few lucky class picks she eventually found an academic context for her interests in legacy and history. She began with studio art, which led her to art history, which finally led her to political science. “A lot of times the things I’m studying seem exactly the same. I take artifacts from the past, and talk about what they mean now, in whatever the specific context is. I feel like I’m always doing that same type of thinking,” West said. Her inquisitive nature in class demonstrates her appreciation for the past and her desire to inspire change. Additionally, West has served as a dedicated research assistant for Art History and Black Studies Professor Rowland Abiodun — West was even published in his book — and Black Studies Professor John Drabinski. 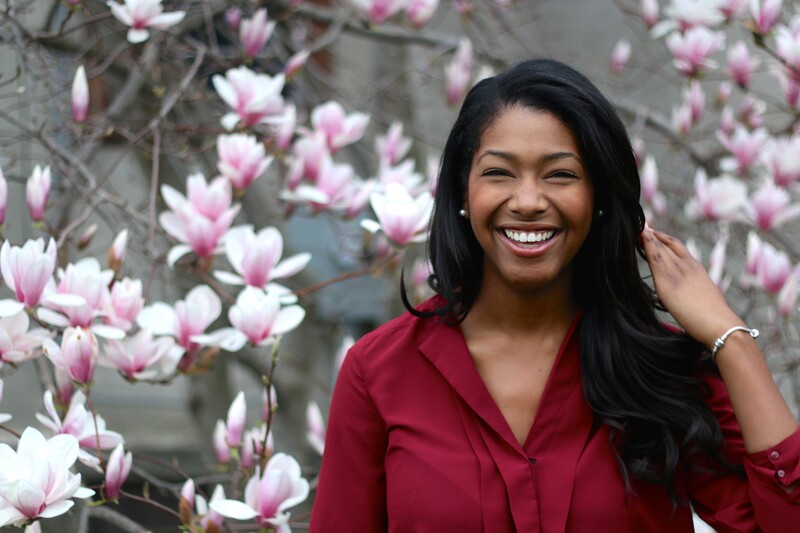 Her poise in striving to inspire positive change for minorities hasn’t gone unnoticed. West’s passion for leadership and inspiring change has influenced all aspects of campus life. Her characteristic ardor has led to her unwavering commitment to a variety of groups such as, Judiciary Council, the Black Student Union executive board, the DASAC dance group, the Senior Gift Committee and her role as an Engagement Fellow working in alumni relations. And as you might have guessed, all these organizations stress the importance of giving back to the community. Savannah was granted one of four open spots on DASAC her first year at Amherst. In gracing the DASAC stage, West was able to work towards her major goal of bettering the Amherst community. West joined the DASAC team as a way of honoring arts on campus, and she noted that arts on this campus can be heavily underappreciated. DASAC proved to be a good growth experience for West as well. “It was my first family and it built my confidence,” she said. West’s efforts as an Engagement Fellow and chair of the Senior Gift Committee are another direct parallel to her values: She connects alumni new and old to the current Amherst community, and encourages all to give back in order to allow others the same Amherst experience she has had. Despite the rigors of her busy schedule, each commitment gets West’s full attention. This holds true as well for the meaningful relationships in West’s life — she maintains unfaltering kindness and sincerity with all whom she knows. “Savannah is responsible, loyal and dependable, as can be seen through her ability to do all that she does and still maintain enough sanity to be the fun-loving friend she is,” her friend Katherine Ponds ’15 said. As evidenced by the poise and “smart politics,” as Drabinski put it, exercised in her political science and black studies courses, as well as in her role as a research assistant, West hopes to build her legacy through public service. West’s post-Amherst legacy will begin next January, with the start of her Fulbright English Teaching Assistantship, after she studies for and takes the LSAT. The Fulbright application process was grueling, and required the support of the friends West cherishes so well, but now she is simply “glad” to have gone through the process. West will be heading to South Africa to teach and to explore the subjects that she stumbled upon through her natural curiosity: history, politics, art. West said she is excited to learn more about the legacy of South Africa’s civil rights struggles.